A new website is aiming to make online charity shopping easier for buyers by bringing a range of products under one roof. The website was nitially launched with the Christmas market in mind. Buyers can choose items from six categories: home, outdoor and pets, fashion, stationery and books, games and toys, and seasonal, including Christmas and weddings. The platform is designed to showcase products with images that link directly to the specific charity’s website, so all purchases are completed through the organisation. Charities do not pay for a presence on the site. 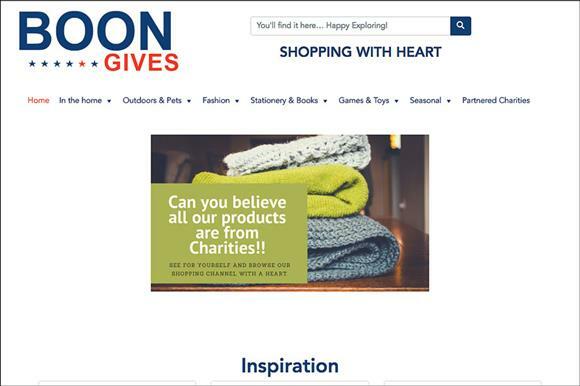 Jen McCormick, one of the three founders of the site, said the impetus for BOON Gives was the belief that charitable online shops were not getting the exposure they deserved. "No matter if a charity is big or small, we hope to raise awareness and by doing so help those who need it most," she said. "BOON Gives is a way to show appreciation for all the hard work undertaken by charities to make this world a better place for all." McCormick added that BOON Gives is a project she has financed herself. Currently payment from larger charities such as Guide Dogs and the National Trust comes through an affiliate scheme run by the affiliate marketing organisation AWIN. BOON Gives receives a percentage of the sales basket if people buy on a charity’s website after linking from the umbrella site. Smaller charities are not charged. "We take money only for products sold via charities from AWIN-affiliated sites," McCormick said. "Any money we make from them goes directly back into the site, be it data inputting, marketing or link management." McCormick said that other financial options were yet to be explored, including possible relationships with suppliers and other relevant companies that might provide advertising or sponsorship. For now, the affiliate scheme is the only source of revenue and for those charities not in an affiliate scheme there is no charge. "We will investigate all options for other income before passing costs on to the charities," she said. BOON Gives is appealing for more charities to be involved and help make the one-stop shop a 24/7 destination.